Never one to waste a good crisis, Democratic Senate Minority Leader Chuck Schumer spared no time seizing on the recent suicide deaths of two Parkland students and a Sandy Hook victim's father to push his gun control agenda – rushing to his soapbox so fast, in fact, that he accidentally named a "suicide victim" who's still alive. 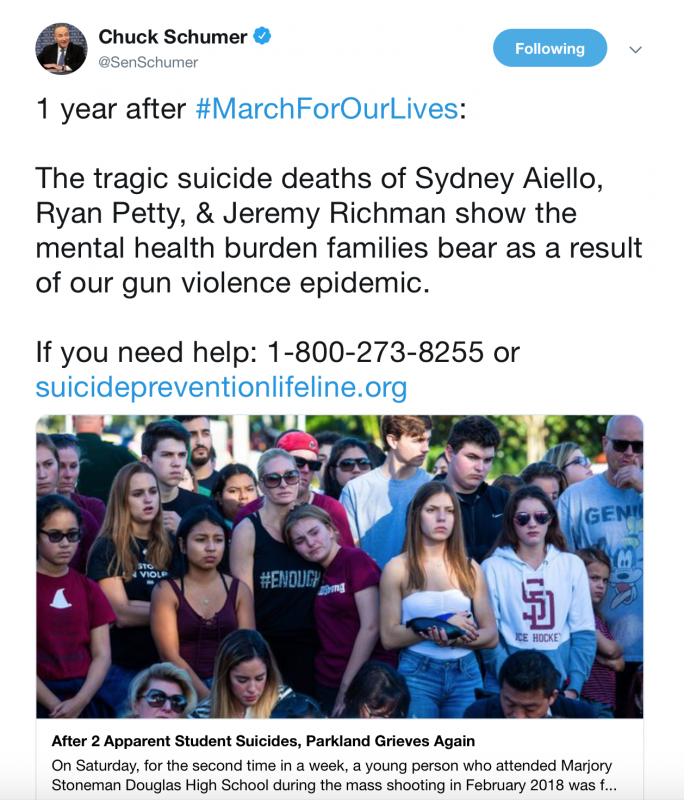 In a tweet Monday, Schumer used the recent self-inflicted deaths of Sydney Aiello, 19, and Jeremy Richman, 49, as springboards to decry America’s “gun violence epidemic.” Aiello was one of two Marjory Stoneman Douglas High School students who reportedly committed suicide last week, while Richman, whose daughter Avielle was shot and killed during the Sandy Hook massacre in 2012, was found dead of an apparent suicide Monday. Unfortunately, Schumer was too busy pushing his anti-gun agenda to check his facts before using the tragedies as a talking point. While Aiello and Richman did tragically take their own lives within the span of a few days last week, Ryan Petty, father of Parkland shooting victim Alaina Petty, is not a student. On top of that, he's very much alive. In fact, Petty has been a vocal advocate of school safety while simultaneously pushing back on efforts to use his daughter’s death as a platform to push widespread gun control. Soon after Petty tweeted back explaining he wasn’t dead, Schumer – or someone in his office, at least – deleted his tweet. The second Parkland student who police say took their own life on Saturday has not yet been named.